July 09, 2012 • Heidi Shenk • "design" • "recipe cards"
I have something to admit. It may or may not be something you have or have not noticed. I've fallen way behind on my Design a Day Challenge thingy-ma-jiggy. It sort of started when Andrew's parents were in town, and then I never really got back on track. I'm ok with it though. I've still designed a lot of stuff, and to be quite honest, I have been enjoying summer break too much to update you every single day. I haven't even had the chance to get everything in my shop yet. It was another busy weekend. Andrew and I painted our bedroom, and we had important errands to run like going to the home brew store to get more supplies for our home brewing adventures. I had a little bit of time while Andrew was doing paint prep to list my new line of recipe cards that I had been working on this past week. While I was brainstorming a few weeks ago with Andrew for design ideas, he had suggested a summer theme of some sort. I think his exact words were, "Draw a lemonade pitcher and a lemon and put it on a note card." In fact I have something sorta like that written down on my ridiculously long brainstorm list. 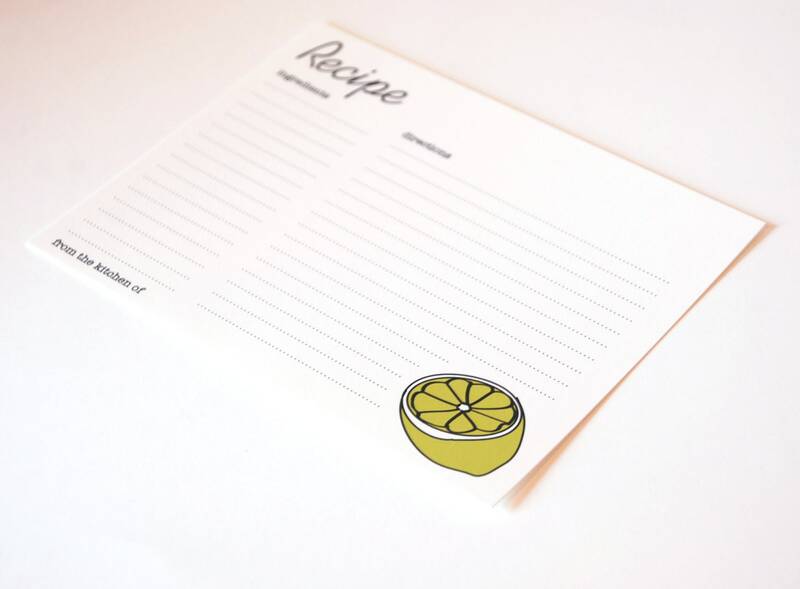 I thought it made more sense to put a lemonade pitcher on a recipe card, so I started with that idea in mind. When I drew my lemon, I decided to turn it into a lime because I like limes better than lemons. Maybe it was the fact that it was 107 degrees outside and a mojito with some fresh squeezed lime sounded really good at that moment. I don't know. But regardless, I decided that the lemon should be a lime. End result? 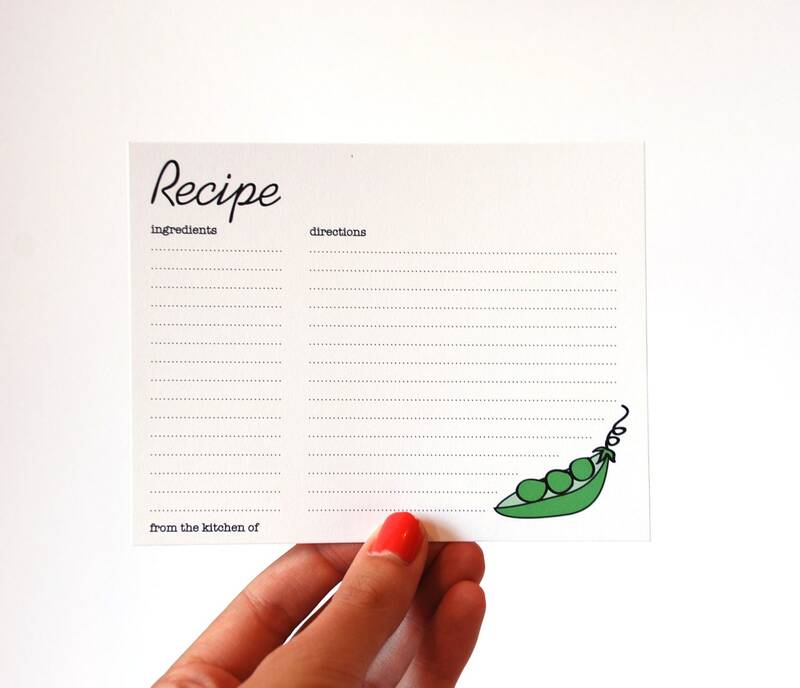 A lime on a recipe card. No lemonade pitcher. Ooops. I guess that's why "lemonade pitcher card" is not scratched out yet. Anyway, this recipe card got my juices flowing (pun TOTALLY intended... I'm cheesy like that) and I rehashed an old avocado design I'd used a couple years back and slapped that on a recipe card. Dear old avocado then gave me the brilliant idea of creating a few more fruits or veggies to complete the scene. So in came Mr. Peach. And clearly, summer wouldn't be summer without some cute little peas in a pod. 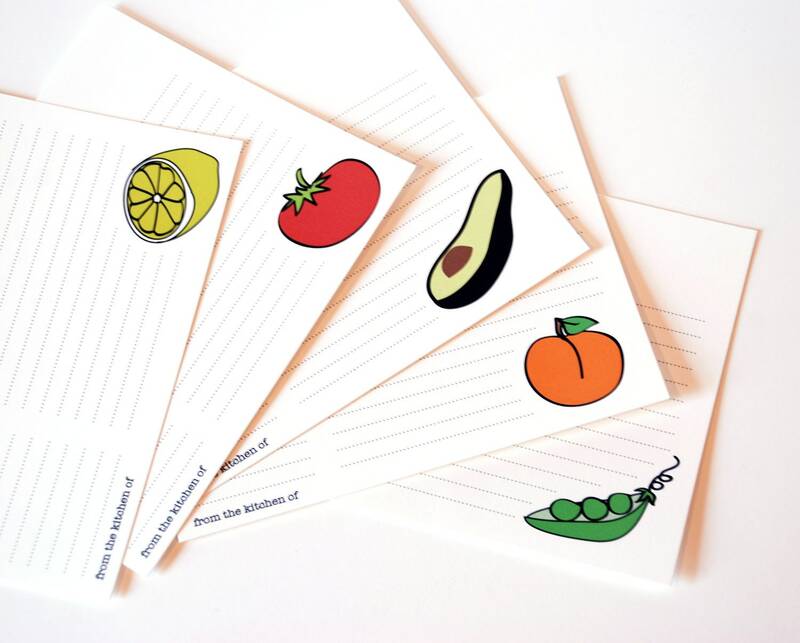 And now I have a cute little family of fruit and veggies on some recipe cards. And in case you feel like investing in a few of these guys, you can click through the photos to be taken to the listings. I have to say, I'm quite content with my little fruit and veggie medley. I like the summer crispness of the cards if that makes any sense. Bright and simple and perfect for summer if I must say so myself. What sorts of projects or designs have you been working on lately? July 01, 2011 • Heidi Shenk • "cards" • "design a day" • "design" • "recipe cards" • "stationery"
Apparently running a day behind with posting is the new trend. But don't worry, I'm still on track for my Design a Day Challenge. I had true intentions of getting this design up for you yesterday, but three things caused me to do otherwise. 2. Walking the dog took way longer than it should have. 3. We went to the O's game and between the other two things on this list, I ended up running out of time to actually write my post for the day. But I am still on track. Have no fear. And the design for yesterday is something that encompasses three things that I already currently design-- note cards, recipe cards, and gift tags. I went with a blue and green bubble design and squeaked out this fun little stationery gift pack. 4 note cards, 4 recipe cards, and 4 gift tags. It's kind of the perfect thing! And please, don't judge the photos as of late. Like I said, Photoshop crashed. I'm waiting to reinstall until I get a new external hard drive so I don't put so much wear and tear on my MacBook. Hopefully I'll be able to do this soon. For now, I'll just enjoy these bubbles and remind myself that the good news is I didn't lose any files. Be ready for another new design this afternoon! February 10, 2011 • Heidi Shenk • "cards" • "crafts" • "cuisine" • "recipe cards"
As I was cooking up another fabulous dinner the other night, it dawned upon me that there was something missing from my collection-- recipe cards! 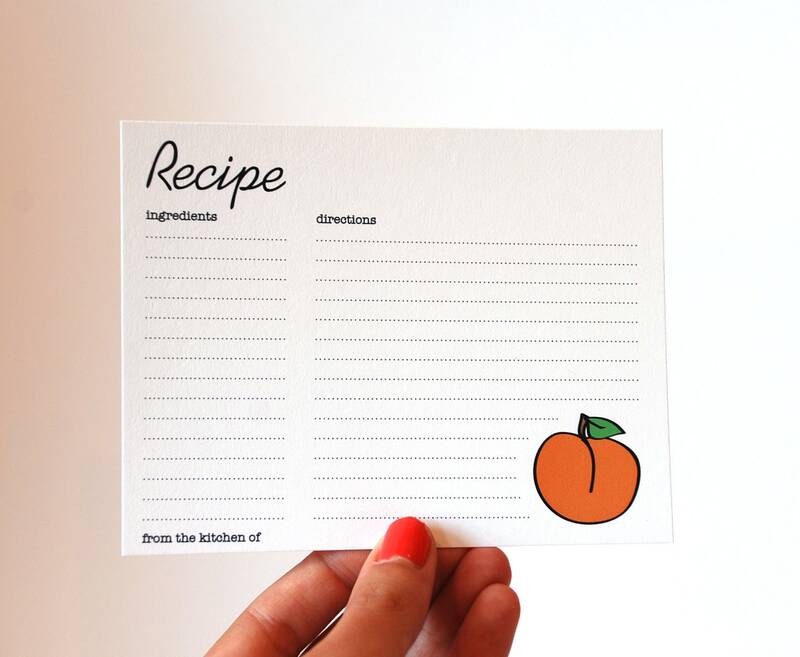 It seemed so obvious and I couldn't believe that I had not previously thought about designing some fun little cards to organize my recipes! Really it only seemed natural that this sort of thing should be created. So I spent a day home sick with a nasty sinus infection designing these quite stylishly modern recipe cards. So far they have been a hit! 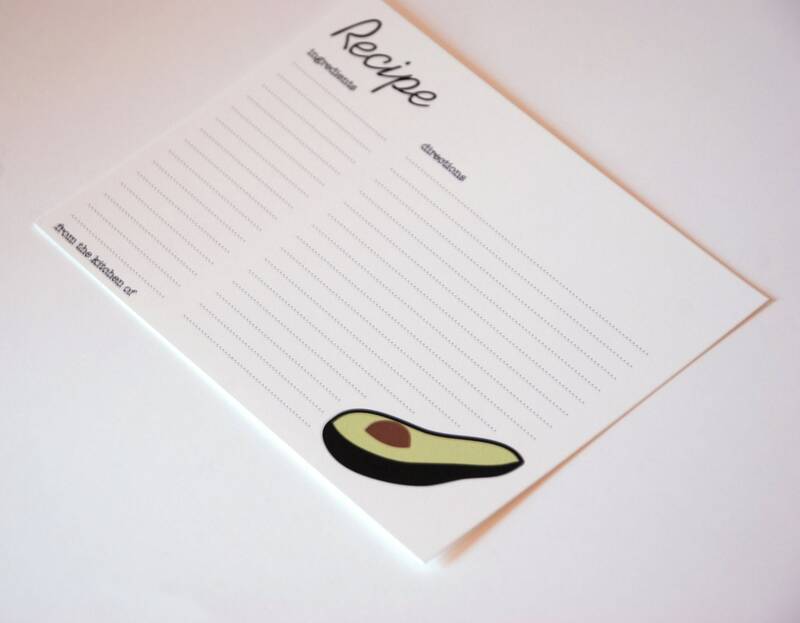 I only listed them on my Etsy shop yesterday and I sold a set of the Avocado recipe cards and many people have expressed interest in them. They were really quite fun to design! With the avocado colored cards, I kept in mind colors of the kitchen (notably the greens and browns of the avocado). I like these the best of the two sets I created and am looking forward to designing more food color inspired recipe cards. I am thinking eggplant, butternut squash, strawberry, and other such rich and vibrant colors. Last time I wrote about starting on a new set of wine corks. That is still in the works. It seems at times my creative juices begin flowing so much that I get caught up in new ideas. The wine corks will be made as I was happy with the original few that I made in December. It may just take a while longer than expected to get back on track with my project schedule! But in the end, I guess that is the fun of such creative endeavors-- the ability to stem from one project to the next. 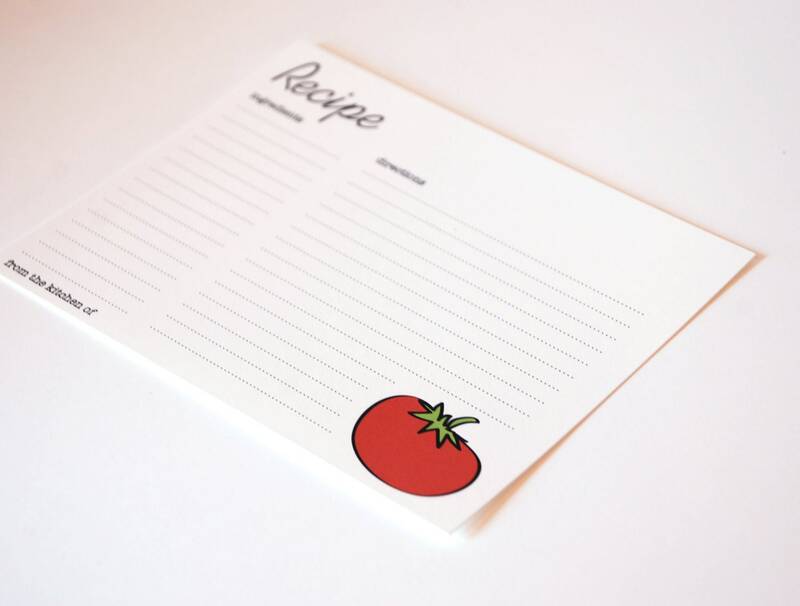 For now, I'll be designing more recipe cards tonight, and be using them in my kitchen tomorrow.